Latvia’s State Security Service has decided to not commence a criminal process regarding the cooperation between Riga City Council and the design firm responsible for the Crimean Bridge. This decision was made because the investigation revealed there was no crime committed because the municipality commenced cooperation with the company before international sanctions were imposed against the Russian Federation. This was the response SSS provided to Riga City Council’s faction of the National Alliance ‘All for Latvia’-‘For Fatherland and Freedom/LNNK’. 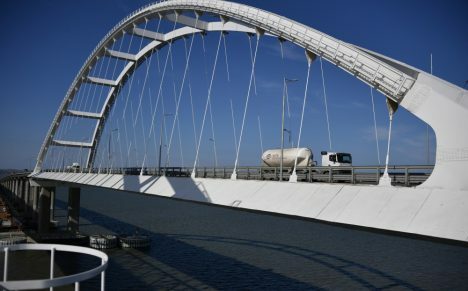 Last year, 29 October, the National Alliance’s faction turned to SSS (then known as Security Police), requesting an investigation of the cooperation with the Russian company that designed the Crimean Bridge in the design of the traffic overpass in Riga in breach of EU sanctions, reminds the representative of the party Edgars Ratnieks. Following this request from NA, SSS commenced an investigation. SSS notes that Russian Federation-based closed joint stock company Institut Giprostrojmost–Sankt-Peterburg is a member of G.B.V. general partnership. On 17 August 2016, Riga City Council’s Transport Department signed a contract with G.B.V. for the design and maintenance of Eastern highway’s ‘Ieriķu Street – Vietlavas Street’ section. The investigation performed by SSS determined that Riga City Council’s Transport Department had performed two of the first payments to G.B.V. before sanctions were applied. The final payment to the contracted company has yet to be performed. SSS explains that legal persons under EU jurisdiction are not allowed to provide finances to legal persons currently under sanctions. However, if money transfers are performed in accordance with a contract signed before sanctions were imposed against the contracted legal person this means a case of exception. With that, legislation does not provide for taking action in relation to contracts signed before application of sanctions. Still, authorities have a duty to make sure all payments are performed in accordance with contractual obligations. In July 2018, European Council amendment the Regulation concerning restrictive measures in respect of actions undermining or threatening the territorial integrity, sovereignty and independence of Ukraine. With the amendment of the regulation, AO InstitutGiprostrojmost-Sankt-Peterburg came under sanctions. SSS adds that the law does not allow political faction representatives to appeal decisions made by the security service.